Newberry, Paradise, Sault Ste. Marie, St. Ignace, Manistique, Escanaba, Marquette, Munising, Grand Marais and all points in between. Upper Michigan Garage Doors, Hunter Garage Doors, Garage Doors of the Upper Peninsula, Upper Peninsula Garage Doors, UP Garage Door Installation Garage Doors for: Newberry, Paradise, Sault Ste. Marie, St. Ignace, Manistique, Escanaba, Marquette, Munising, Grand Marais and all points in between. "Specializing in Garage Doors and Garage Door Openers"
Upper Michigan's Hunter Garage Doors specializes in the installation of commercial and residential garage doors and openers. They also provide a full line of maintenance services. 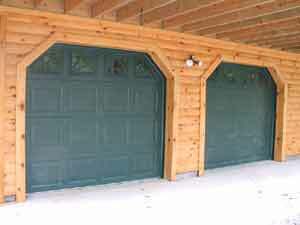 They can repair and fine tune your already existing doors or install a beautiful new door in your brand new garage. 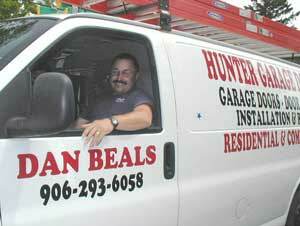 The owner of Hunter Garage Doors, Dan Beals has worked hard to build his company's reputation of excellent workmanship. Whether it's a simple one door design or an elaborate four door plan, Hunter Garage Doors can perform the task at hand. Hunter Garage Doors "Hit the Mark" of excellence! Servicing a large portion of the Eastern Upper Peninsula, Dan Beals and Hunter Garage Doors of Michigan is your professional answer to all of your garage door installation needs. Call upon Hunter Garage Doors! 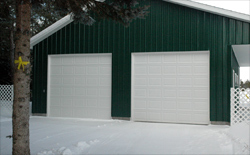 They have the expertise and know-how to complete all of your garage door needs and maintenance. Visit their endorsements page for a full listing of testimonials from customers in the Upper Peninsula of Michigan! 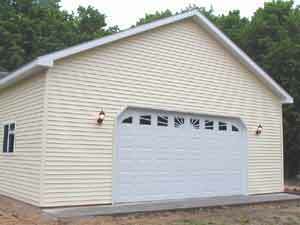 Hunter Garage Doors also provides the Upper Peninsula with top quality commerical garage door installation and maintenance. Garage Doors, Openers & the Finishing Touches! (906) 293 -6058 or (906) 440-6401. "They did a wonderful job and the doors are beautiful. They did a total of three doors for us." Visit their endorsements page for testimonials for Hunter Garage Doors. Dan Beals is ready to visit you today! He is your experienced and professional choice in garage door installation, repair and openers. Servicing a large portion of the Upper Peninsula, we've got you covered! Hunter Garage Doors services all makes and models of doors. 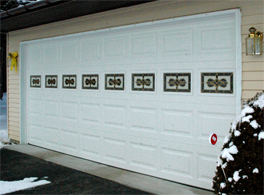 As a service to our customers, we specialize and sell Clopay Garage Doors. Please feel free to visit and browse their site by clicking the picture to the left. They are quality doors for residential and commercial use that have earned the "Good Housekeeping" endorsement. Please feel free to visit and browse their site by clicking the picture to the left. They are quality doors for residential and commercial use that have earned the "Good Housekeeping" endorsement.